The ESL English language communication skill tests that students are preparing for include: TOEFL, TOEIC, IELTS, Cambridge CFA CPC CAE FCA, GMAT, GRE, SAT, LSAT, DSAT, CAEL, Cantest, college board, IH, AP, TSE, YLE, BULATS, ILEC, and Michigan exams. - Students score low because they do not understand the test requirements. - Students underestimate the large volume of work necessary to score high. - Students score low because they have limited English vocabulary. - Students score low because some English skills are not practiced. - Students score low because they rely on "secret tips" rather than realskill. - Students score low because they cram for tests and become confused. - Students score low because they become upset and cannot perform. What English Should I study to score high on English Tests? There is only one English language. There are a variety of programs and courses that overlap each other. 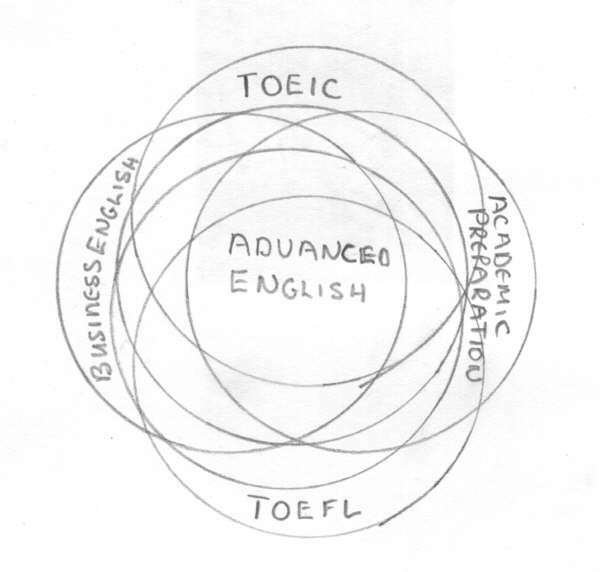 Many business English courses cover 90% of what students require to pass the TOEIC exam. Many advanced English courses cover 90 % of what is required to pass TOEFL, TOEIC, AP, IELTS and other English tests. Many Toeic, toefl, IELTS courses only provide practice tests without teaching any vocabulary the four English skills and applied grammar practice. Students must create a plan to increase all applied English skills, vocabulary and become comfortable with the test requirements and answer formats. Students should take combinations of programs to Score High on English Language tests. For example: Advanced students could take 100 hours of business English, 200 hours of academic preparation and 10 hours of toefl test prep and score high on the new TOEFL test . The only secret is to have a balance of applied English skills and factual knowledge. The following is an example of a balanced study program. To have a test preparation program designed for you contact ESL in Canada for a consultation with an educational consultant. Link to original "How to Score HIGH on NEW English Tests"